In the Manchester neighbourhood standings, Levenshulme seems to get more than its fair share of love. I've only been there a few times myself and didn't really spend enough time to get a real sense of the place, so I've always wondered: what is it about Levenshulme that inspires such devotion? The newest manifestation of this good vibe emanating from South Manchester is Love Levenshulme. It's a project that invites L-hulme residents to write the things they love about living there on a special postcard, which they can give or send to people or businesses they want to show their appreciation to. Project organiser Matt Clements describes it on the Love Levenshulme blog as "a kind of underground viral appreciation marketing." He explains it thusly: “It all started off as a little homespun idea to try to show some appreciation for people in the community who do the little everyday things that make a big difference. I’d be strolling round Levenshulme with my children, pointing out gardens where people had made a real effort, or meeting friendly people in shops, and I wanted to find a way of saying ‘thanks.’” What a lovely idea. 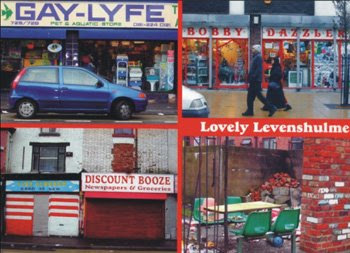 Visit LL HQ to find out where to get the postcards, and to read what some Levenshulme-based bloggers have to say about their hood. I should really point out that the postcard at the top of this article isn't the free LoveLevenshulme postcard that I designed! To see the offical one, just visit the lovelevenshulme.com blog. Oh, Matt, I'm sorry if you thought I was suggesting that image was your postcard... I wasn't at all! I just love those bizarre anti-touristic postcards, but of course I imagine yours look very different. Send us an image if you have one and I'll put it in the blog post.